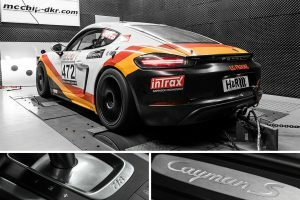 From now on, we offer software performance upgrades (Stage1) for all Porsche Cayman and Boxster 718 models with 2.0 / 2.5 turbo engines. After a long test and development period, we can individually modify and program the engine control units of all 718 models. We are currently working on a Stage 2 performance upgrade, which includes besides to the software optimization also a mcpipes downpipe!